WARNING:root:Keras version 2.1.2 detected. 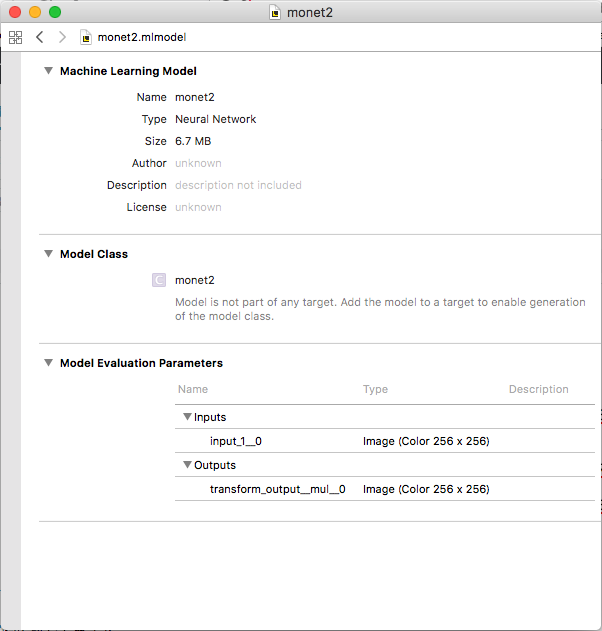 Last version known to be fully compatible of Keras is 2.0.4 . WARNING:root:TensorFlow version 1.4.1 detected. Last version known to be fully compatible is 1.1.1 . Converted 122 variables to const ops. WARNING:root:Keras version 2.1.2 detected. Last version known to be fully compatible of Keras is 2.0.6 . WARNING:root:TensorFlow version 1.4.1 detected. Last version known to be fully compatible is 1.2.1 . This will modify the Model_pb spec passed in. @IBOutlet private weak var imageView: UIImageView! let device = AVCaptureDevice.default(.builtInWideAngleCamera, for: .video, position: .back)!